Wow, was that a good game or what??? First off, even if I didn’t care who was playing, that was a hard fought and exciting game. But the Patriots lost!! I couldn’t believe it, because they were such a long shot, and I was so sick of the media talking about the “pursuit of perfection” by the Cheatriots, er Patriots. Newsflash: if you cheat, it’s not perfection. What happens to Olympic athletes who are caught cheating? They have to give their medals back. Here’s a little commercial I really liked. 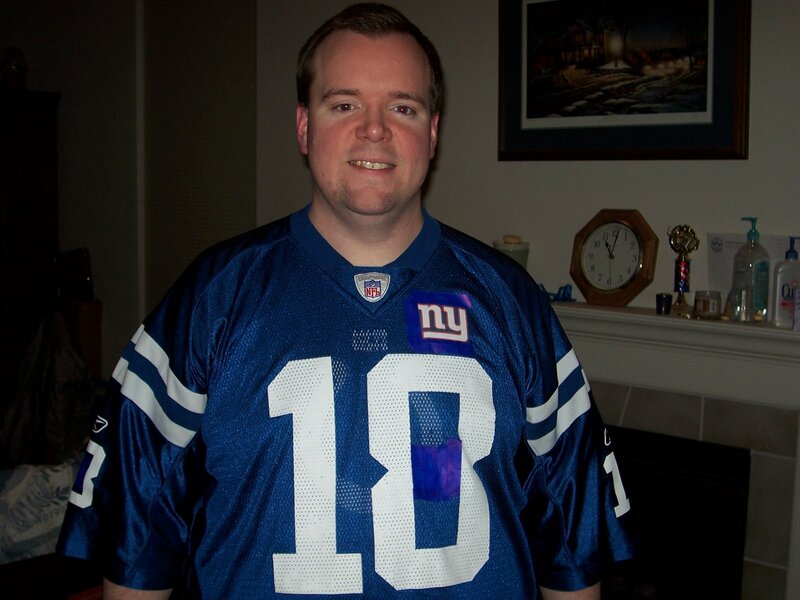 And here’s a good picture of me in my “Giants” jersey. I just modified my #18 Peyton Manning jersey a little to make it a #10 Eli Manning jersey. Thanks, little brother! 1 Response to Giants Beat the Patriots!!!! >You’re right! That turned out well! It looks a lot different than the one I saw the guy at church wearing though. He did his very different.But I concur! Good job Giants!!! !